But the call for Israel to open its borders is nothing more than a way of making it easier for terrorists to strike. Ellison's letter buries its real agenda in paragraphs of prose about how everyone will be better off, except somehow Hamas, if Israel complies with their demand... that Israel ease the movement of people in and out of Gaza. This of course is a fancy way of saying, "Let my Suicide Bombers go". None of this is up till now is shocking. But what Congressman Keith Ellison accomplished was to convince 53 other Democratic congressmen to join him in this venture. It is not particularly surprising to find the House's most radical anti-Israel voices signing their names onto Ellison's letter. It would be inconceivable if a letter aiding Hamas did not carry the signatures of Barbara Lee, Jim Moran or Jim McDermott, who helped Ellison spearhead the whole campaign. 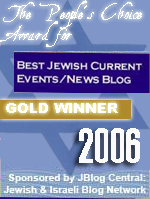 It is essentially inconceivable that any letter circulated in congress opposing Israel would not get their signature. 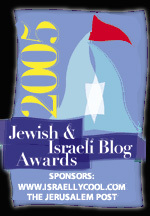 Jim Moran had managed to blame even the Iraq War on the Jews and McDermott was actually named CAIR's Public Official of the Year. Neither is West Virginia Arab Congressman, Nick Rahall, who is the Democratic party's version of Darrel Issa, who is tied to CAIR as well, and previously voted against Israel's right to defend itself. Rahall is also the top recipient of CAIR donations. The likes of Diane Watson or Pete Stark aren't complete surprises either. Pete Stark has a history of being both anti-Israel and unstable. Neither is Carolyn Kilpatrick, who voted against Israel's right to defend itself, and against condemning terrorist attacks on Israel. Kilpatrick, like virtually every Democrat on the list, is also tied to CAIR. Then there's William Delahunt, who all but openly expressed the hope that a former Cheney aide would be targeted by Al Queda. John Conyers signing on to this while awaiting prison is no real shocker either. The man has all but endorsed Sharia law in America. Or John Dingell who like many Detroit politicians has gone whole hog with the Islamist Follow Traveler thing. Congresswoman Betty McCollum has been waging her own private war on Israel, right down to issuing an imperial demand that Israeli Ambassador Oren attend the national conference of the far left anti-Israel group, J Street. McCollum famously belittled Hamas' shelling of Israel as nothing more than a drug gang's drive by shooting and repeated the discredited white phosphorous smear. Again, no more surprising than Chaka Fattah's presence on the list. Then there's Eric Massa, a former Republican turned turncoat Democrat, Massa has been consistently loudly anti-war and to the left. Like virtually every congressman on this list, he's pushed for a phony ceasefire, that would naturally be one sided. Considering his increasingly unhinged radicalism, and that he has an election coming up soon, Massa must be pretty confident that the nutroots can get him reelected. It is of course no surprise that this list weighs heavily toward Minnesota and Michigan, where CAIR is strong. But it also includes twelve congressmen from California, 3 from New Jersey, 4 from New York and 6 from Massachusetts. These numbers are not mere statistics, they define the rising influence of the Muslim Brotherhood on American politics, state by state. And it is instructive to note how many of the congressmen and congresswomen on the list are funded by CAIR money. Keith Ellison, John Conyers, Loretta Sanchez, Betty McCollum, Lois Capps, Bill Pascrell, Elijah Cummings, Bob Filner, Mike Honda, Barbara Lee, John Dingell, James Moran, Nick Rahall, Andre Carson, Mary Jo Kilroy, Carolyn Kilpatrick and Jim McDermott are among the top receivers of CAIR money in congress. 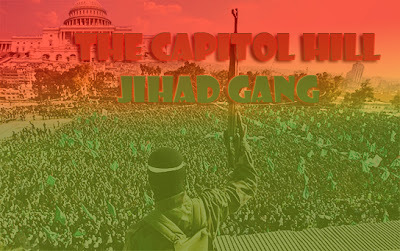 Of the top 11 CAIR moneygetters in congress, Nick Rahall, James Moran, Darrel Issa, John Conyers, Dennis Kucinich, Jesse Jackson, Jr, John Dingell, Barbara Lee, Carolyn Kilpatrick, Shelia Jackson Lee and Jim McDerrmott-- 7 out of 11 signed on to Ellison's letter. That makes the Gaza letter a CAIR project. 5 on that list voted against condemning attacks on Israel. And the letter is simply an opening shot as part of a broader campaign by the Muslim Brotherhood and its American proxies to attack Israel and promote its own Hamas wing. 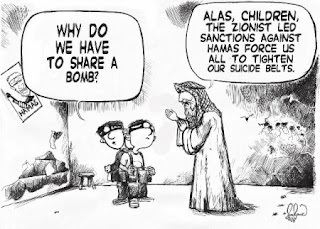 Its proxies can't openly come out for Hamas, not in the United States anyway. Not from members of congress. But they can work toward a common goal. With this letter, Hamas's masters in the Muslim Brotherhood demonstrated that they can use CAIR to gather 54 congressmen together to push its agenda. That is quite a leap for an organization that is the unindicted co-conspirator in funding Hamas terror It also demonstrates that Amerabia isn't as far away as we have thought. your obviously a bigot who promotes the language of hate. On a happier note, its good to see the are some congressmen who are actually informed about this conflict and don't subscribe to the trash peddled here. It would be nice to get a list of the congressmen and the states and district that they come from. It's clear that the muslim lobby has more power than the much talked about Israel lobby. Also it is confounding that Jews stubbornly cling to the democratic party. I've been reading your blog every day for over a year now and unlike Anonymous, "your friendly neighborhood Muslim" … I find your blog neither "Bigoted" nor misinformed. In fact the only "TRASH" to be found in it comes from comments from people like him. I applaud you work … keep it up. America and Israel needs more people like you. Thank you, Following. But being hated by someone who wishes Death to Zion is praise as far as I'm concerned. LEL, yes it does, backed by a lot of Saudi money. But most liberal Jews no longer care very much about israel. An interesting, if minor to non-Pennsylvanians, point. Although Joe Sestak (D-PA) may not have been one of CAIR's largest recipients of $, Sestak actually helped THEM RAISE $ when he spoke at a fundraiser for CAIR several years ago. Also, his first hire was a former employee of CAIR. And one more digression: Sestak is now running for the US Senate in the D primary against Arlen Specter. As much as I hate to, I have to vote for Arlen on this one. You can add to the pro terror group The Republican candidate for the Senate in California, Tom Campbell the Jew hater and terrorist lover. The real kicker to Ellison is that he's on the Congressional Task Force on Antisemitism. When the task force was launched, the Congressional Human Rights Caucus said its primary role "is to bring to light specific cases of anti-Semitism and educate Members of Congress, world leaders and citizens about the horrors that these cases pose on society." Very specific. It even says "specific cases of antisemitism." Okay? 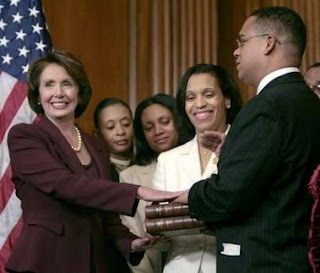 But according to Ellison's website (if not now, then it was so in Sept.07), this then-new task force "promotes religious tolerance throughout the world, and brings a strong voice in the United States Congress to those whose basic religious rights and freedoms have been persecuted." Argh. The scumbucket even infiltrated the anti-anti-semite club in Congress. It's a shondeh (disgrace) that most of us Jews just sit back and let him do it. And p.s., we're working on Rahall here in West-byGD-Virginia. This info will help. Todah! This is one of the very best websites, evah! It is right on the money and speaks of our precious country and freedom. From the land of rahmbo, obumbler, axelhead, etc. "your obviously a bigot who promotes the language of hate. On a happier note, its good to see the are some congressmen who are actually informed about this conflict and don't subscribe to the trash peddled here. I see Rep. Loretta Sanchez (D-47) stopped by to say a few words. This woman is a disgrace! Between her support of illegal invaders from mexico and hamas, America and her citizens do not stand a chance. I have seen the enemy and it's Lorretta Sanchez! on the money.. 100%.. smack on the button. I applaud.. Honestly, its fantastic you see the threat inside the US,.. Yes, to know him is to love him! I think they should release Charles Manson for time served and the remainder of his sentence to house arrest.